Home » Spread or Spreaded – Is Spreaded a Word? Language learners have always been perplexed by verb conjugation in new languages. As if regular verbs weren’t difficult enough to remember, irregular verbs have their own sets of rules. Irregular verbs in English are fairly common. Sometimes, words remain unchanged in various tenses, while other times, tenses are almost unrecognizable as the same verb. Spread is an irregular verb, but as irregular verbs go, it is fairly benign. What is the Difference Between Spread and Spreaded? In this post, I will compare spread vs. spreaded. I will outline the correct conjugation of this verb and use it in several example sentences, so you can see how it appears in context. Plus, I will show you a helpful memory tool that makes choosing either spread or spreaded easy for your own writing. What does spread mean? Spread has a few different meanings, but, in this post, I will focus on its use as a verb that means to open out over a large area. Spread is an irregular verb, which means its conjugation does not follow the standard English rules. Regular verbs have the letters “ed” added to them to make the past tense. Love > Loved > Loved. Spread, however, is an irregular verb, so it doesn’t follow this inflection. Spread > Spread > Spread. A person spreads sheets over a bed while making it each morning. The same person might also spread butter on toast for breakfast afterward. “Jesus spread out his arms on the cross and died for the sins of the world,” cried the street corner preacher. The mute, bearded pirate grinned widely, spread out the map on the deck of his ship, and pointed to a small island where his treasure was buried. What does sometimes mean? 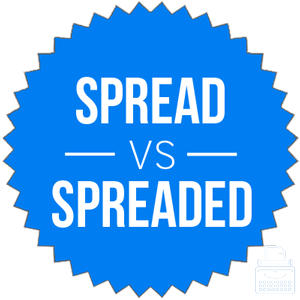 Spreaded is an incorrect conjugation of spread, based on an overgeneralization of regular verb conjugation rules to the irregular spread. It is not considered a standard usage. This chart isn’t exhaustive in its literary scope, since it only looks at English books published since 1800, but it still clearly shows that spreaded does not have wide usage. In fact, spreaded is so infrequently used that Garner’s Modern English Usage estimates the disparity to be 1,525:1 between the two words. Spread remains unchanged in the past tense. There is never a good reason to use spreaded in academic or professional writing contexts. If you grew up (or ate in anyone’s house who grew up) during the period in American culture when margarine was considered a healthy alternative to butter, you may have been an unfortunate consumer of a product called Shedd’s Spread. Since the product was called “Shedd’s Spread” and not “Shedd’s Spreaded,” remembering that spreaded is not a real word should be easy. Alternatively, you can remember how this word is conjugated by looking at the word it contains. Spread contains the word read, another irregular verb. Just as read does not change into readed, neither does spread change into spreaded. Is it spreaded or spread? Spread is a verb that means to open out over a large area. It remains unchanged in the past tense. Spread is the correct past tense. Spreaded is a spelling error. 1 What is the Difference Between Spread and Spreaded? Spoilt or Spoiled – What’s the Difference?